Data-Linc Group’s wireless, license-free SRM6130 Serial Modem offers superior reliability, versatility and performance for wireless serial transmission. It offers an unsurpassed rated range of up to 15 miles (24 km) with line-of-sight and omni directional antennas, farther with Repeaters and/ or high gain antennas. The SRM6130 is the next generation of the proven SRM6100 serial modem, and is fully backward compatible. The SRM6130 employs Smart SpectrumTM frequency hopping spread spectrum (FHSS) technology in the 2.4-2.4835 GHz frequency band for secure, robust communication. Data-Linc Group’s FHSS technology, coupled with 32-bit CRC error detection and AES Encryption enables the SRM6130 to reliably and securely deliver critical information. RF site surveys are usually unnecessary and an FCC site license is not required. The SRM6130 wireless technology eliminates the need for hard wire or fiber cable, which is often expensive and difficult to install. The SRM6130 supports a number of configurations, including point-to-point , point- to-multipoint as well as multiple Repeaters if required. Multipoint operation permits an unlimited number of Remotes. The SRM6130 can also function as a Repeater/Remote to extend range or communicate around obstructions. Back- to-back radio modems are not required for Repeater function. Data-Linc Group’s SRM6130 utilizes Smart Spectrum technology— ideal for critical applications that demand reliable and secure communications. See also Smart Spectrum FAQ. Download a printable pdf (723K) version of this SRM6100 data sheet. To read pdf files you need to get Adobe Acrobat Reader and install it on your PC. 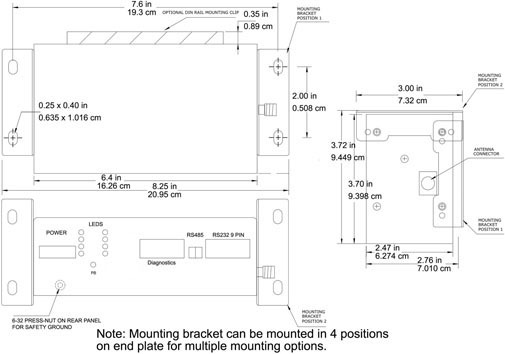 Multiple mounting orientations available with universal mounting brackets. Optional DIN rail clip mounts on the back of the modem. Smart Spectrum uses a high RF data rate to ensure adequate throughput data rates even with high interference. Additionally, the outstanding noise immunity when coupled with a sensitive RF receiver allows long range communication with easy-to-install omni directional antennas. Data-Linc Group’s SRM6330 utilizes Smart Spectrum technology— ideal for critical applications that demand reliable and secure communications. See also Smart Spectrum FAQ.